Home Will Lankan hopes freeze in Jiashen? Will Lankan hopes freeze in Jiashen? The second leg of the Asian Grand Prix 2017 will commence here at the Jiashen Sports Complex, 98 kms away Shanghai, China. The temperature in Jiashen has dropped to 12 degrees Celsius yesterday and Lankan athletes were badly affected by the cold weather that greeted them. They participated in two training sessions and Sri Lankan medal hopes at the second leg is at stake with the unfamiliar weather conditions. The organizers have advised athletes not to eat chicken as a disease is spreading among the poultry farms in Jiashen. Sri Lanka team manageress Mrs. Badra Gunawardena said that the athletes are being provided with boiled water instead of bottled water to assure their safety. The two injured Lankan athletes, Nimali Liyanarachchi (women's 800m) and Waruna Lakshan (men's Javelin throw) will take part in their events in the second leg, even though they have not fully recovered. Waruna has an ankle problem and Nimali has an injured left foot. 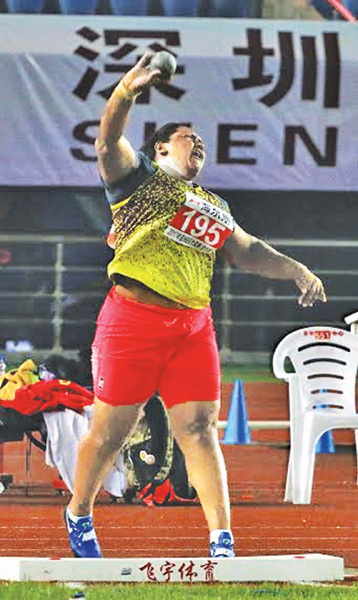 According to head coach Pradeep Nishantha, Waruna was injured during the first leg when he competed on the Mondo track which is totally different from Sri Lanka's synthetic tracks. "The cool weather created a lot of problems in his grip and throw with the numbness. The javelin throw event will last for at least one and a half hours, so it is very difficult to keep the body warmed up in this weather. But Waruna is determined to fight against all these odds," Nishantha said. On the bright side, Waruna's familiar Nemith javelin which the Technical Committee did not allow for him to use in the first leg has been permitted by the same committee and will be an advantage to Waruna. Nimali's personnel coach Sujith Nilantha revealed that she is suffering from the injury for some time and she will be sent to Qatar soon after this meet to make customized running shoes as they have found the problem is with her shoes. “Nimali recorded a better timing a week before, and we have investigated the problem with a Thai physio. His advice was not to compete, but I need to observe her performance and asked her to take part,” Nilantha said.